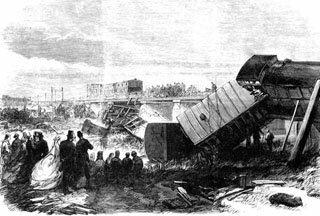 The Victorian era saw an horrific number of fatal train crashes. The writer Charles Dickens was involved in a train crash in Staplehurst but fortunately survived. Here is his eyewitness account. The novelist Charles Dickens was returning from France with his mistress Ellen Ternan and her mother on 9 June 1865 when the train in which they were travelling came off the tracks after running into engineering works at Staplehurst in Kent. 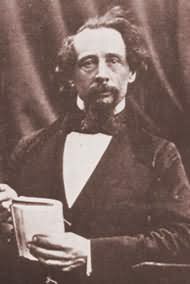 Ten people died and 49 were injured, and Dickens distinguished himself by his heroism. He then climbed back into the carriage to rescue the manuscript of his novel Our Mutual Friend. He died five years later to the day. This account appears in a letter sent by Charles Dickens to his old schoolfriend Thomas Mitton on 13 June 1865. I should have written to you yesterday or the day before, if I had been quite up to writing. I am a little shaken, not by the beating and dragging of the carriage in which I was, but by the hard work afterwards in getting out the dying and dead, which was most horrible. I was in the only carriage that did not go over into the stream. It was caught upon the turn by some of the ruin of the bridge, and hung suspended and balanced in an apparently impossible manner. Two ladies were my fellow passengers; an old one, and a young one. This is exactly what passed:- you may judge from it the precise length of the suspense. Suddenly we were off the rail and beating the ground as the car of a half emptied balloon might. The old lady cried out “My God!” and the young one screamed. 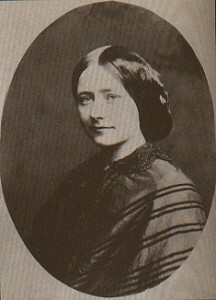 Ellen Ternan, the “young lady sat opposite” and Charles Dickens’ mistress. I caught hold of them both (the old lady sat opposite, and the young one on my left) and said: “We can’t help ourselves, but we can be quiet and composed. Pray don’t cry out.” The old lady immediately answered, “Thank you. Rely upon me. Upon my soul, I will be quiet.” The young lady said in a frantic way, Let us join hands and die friends.” We were then all tilted down together in a corner of the carriage, and stopped. I said to them thereupon: “You may be sure nothing worse can happen. Our danger must be over. Will you remain here without stirring, while I get out of the window?” They both answered quite collectedly, “Yes,” and I got out without the least notion of what had happened. We did it quite safely, by means of a plank or two and when it was done I saw all the rest of the train except the two baggage cars down in the stream. I got into the carriage again for my brandy flask, took off my travelling hat for a basin, climbed down the brickwork, and filled my hat with water. Suddenly I came upon a staggering man covered with blood (I think he must have been flung clean out of his carriage) with such a frightful cut across the skull that I couldn’t bear to look at him. I poured some water over his face, and gave him some to drink, and gave him some brandy, and laid him down on the grass, and he said, “I am gone”, and died afterwards. Then I stumbled over a lady lying on her back against a little pollard tree, with the blood streaming over her face (which was lead colour) in a number of distinct little streams from the head. I asked her if she could swallow a little brandy, and she just nodded, and I gave her some and left her for somebody else. The next time I passed her, she was dead. Then a man examined at the Inquest yesterday (who evidently had not the least remembrance of what really passed) came running up to me and implored me to help him find his wife, who was afterwards found dead. No imagination can conceive the ruin of the carriages, or the extraordinary weights under which the people were lying, or the complications into which they were twisted up among iron and wood, and mud and water. I don’t want to be examined at the Inquests and I don’t want to write about it. It could do no good either way, and I could only seem to speak about myself, which, of course, I would rather not do. I am keeping very quiet here. I have a – I don’t know what to call it – constitutional (I suppose) presence of mind, and was not in the least flustered at the time. I instantly remembered that I had the MS of a Novel with me, and clambered back into the carriage for it. But in writing these scanty words of recollection, I feel the shake and am obliged to stop. Read more about the Staplehurst rail crash at Wikipedia. The scene at Staplehurst after the train crash.